A&A RTS Total War Smack Down. Six Countries, no allies, Canada added very weak starts with militia and must build everything with techs (infantry, halftracks, tanks and more). 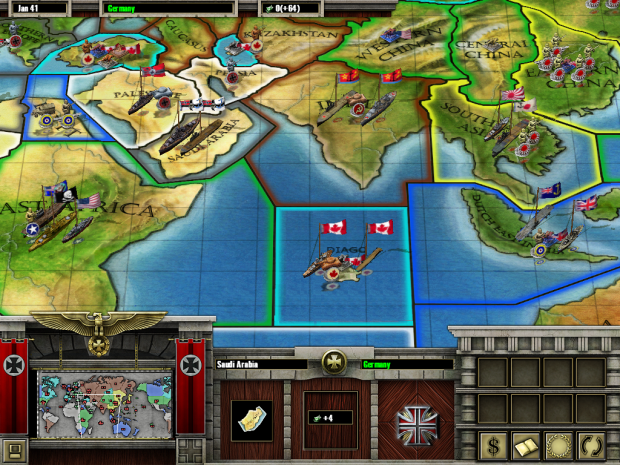 Many new regiments, naval forces and defensive armies. No neutral territories including water territories all must be conquered. Battleships and heavy Cruisers fire on each other automatically forward and aft turrets will fire at different targets they will give chase if you try to withdraw. Aircraft carriers have AAA. Bombers, Fighter Bombers, Fighters and dedicated air escorts are available on carriers and airfields. A&A RTS Total War Smack Down. Six Countries, no allies, Canada added very weak starts with militia and must build everything with techs (infantry, halftracks, tanks and more) all must be built on the WWII map there are no tech available in RTS except for the GER SS Tech. You go to WAR with the army you got. This is a modification to the game and it is a total war, you will have no friends and you will be fighting to stay alive for years. SO SLOW,,,HARRY...IS THAT CALLED DOWNLOAD???!!! Yeah, I tried it, you are right very slow don't know why. But it does download I installed it and it works fine for me. Don't know what I can do to increase the download speed maybe I can try to upload the mod again. No fun waiting for a download. If anyone is interested I have PARTIALLY translated the 10 country Chines mod and it is now understandable to play. They countries are, USA, GBR, RUS, GER, JPN, FIN, NED, ITA, Communist China and Nationalist China. If there is any interest I will post it. I have also added to the Chines mod my maps, Pirates and many other things from my mod and many other mods. It is a lot of fun to play especially when you have no allies and it is a 10 country total war smack down. Windows 8 can be a little tricky in finding where the A&A data folder is located which is the “Favorites/Libraries/Documents/My Documents” folder. The best way to install this patch or any other A&A patch in Windows 8 is to go to any folder on the desk top and open it. If there are no folders on the desk top just create a new folder. Open that folder, on the left top just below “File” drop down you will see “Navigation Pane”. Click on it and you open the Navigation Pane drop down. In the drop down you will see a “Navigation Pane line item”, if it is not already checked, click on that and you will check box it. Once you check box Navigation Pane then in the panel on the left side of the folder you will see “Favorites Folder” appear in the tree. Open that folder and then you will see the “Libraries Folder” appear in the Favorites Folder tree. Click on the “Libraries Folder” to open it. In the Libraries Folder tree you will see “Documents” click on it and open it. In the Documents folder you will see “My Documents” click on it an open it, this is where you put the A&A data folder. You can switch quickly between modes this way only the folder labeled "A&A" with nothing added after it will be read by the game.